Prompt High Quality Work, at a Reasonable Price! Radiant floor heating was used by the Romans by venting hot air under the floors of their villas. Radiant heating technology has been popular in Europe for several decades, and is becoming more and more popular with American homeowners and builders, with the increasing importance of energy efficiency. For indoor comfort, there's nothing like radiant heating. People love waking up and stepping on a warm floor. The ease of control and quiet operation, many design possibilities - almost any floor covering can be used - cost effectiveness and reliability, and optimum heat transfer, make Radiant a very attractive heating solution. There are three kinds of radiant floor heating: hot water (hydronic), electric, and forced air, which pipes hot air though the floor. There are two types of installation for these systems: wet installation, tubing is embedded in a concrete slab or lightweight concrete over a wooden base; or dry installation, radiant floor tubing is snaked between two layers of plywood or underneath a floor. Hydronic (liquid) systems are the most popular and cost-effective type of residential radiant heating systems. 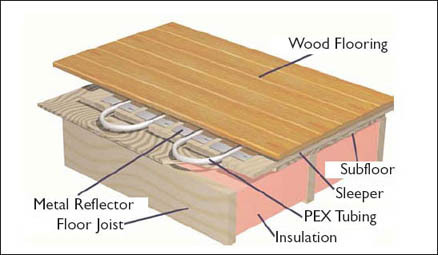 Hydronic systems work by circulating hot water through tubes embedded under the floor. Zone valves and thermostats control individual room temperatures with this system. Copper was used for hydronic radiant heating systems, since the 1940's. It is still the choice of many installers and homeowners because of its superior heat transfer capabilities. It is also noncombustible and extremely dependable. However, copper and the lime in concrete can cause serious corrission problems. PEX is ideally suited for potable water plumbing applications. It is flexible, making it easy to install and service. PEX is able to withstand the high and low temperatures found in plumbing and heating applications, and is highly resistant to chemicals found in the plumbing environment. Although not freeze proof, PEX also provides the homeowner with many useful benefits. Flexible systems are quieter than rigid piping. The smooth interior resists scale buildup and corrosion that can affect long term pipe flow characteristics. PEX is also very freeze- break resistant. Finally, PEX systems have attractive installation costs when compared with rigid materials. PEX is the best piping material for many plumbing applications, but not for outdoor or UV exposed applications. PEX is cross-linked Polyethylene. Through several processes, links between polyethylene macromolecules are formed to create bridges between PE molecules (thus the term "cross-linked). The resulting molecule is more durable under temperature extremes, chemical attack, and resists creep deformation. This makes PEX an excellent material for hot water applications (up to 200° F). Water temperatures are very important in radiant heating systems. Radiant heating systems generally operate with water temperatures of 90-140 degrees. In contrast, hot-water baseboard or radiator system runs with a water temperatures of 160 to 210 degrees. 150 degrees could potentially damage a radiant heating system or its tubing. Home run or manifold plumbing systems utilizing PEX tubing can substantially reduce water and energy consumption in a home. The home-run concept provides dedicated direct lines from the manifold to the fixtures, reducing the amount of water that must be purged from the lines to get hot water at the fixture. Direct lines can be sized to the fixture requirements, further reducing the amount of time to wait for hot water. Faster hot water delivery reduces water waste and the amount of times the water heater must cycle to supply hot water. Exposed surfaces that conduct heat well are best for radiant floor heating, such as finished concrete or ceramic tile. It should be noted that if any later flooring renovation is undertaken, the hydronic radiant floor heating installer should be notified to make any required adjustments to the heating system. Since radiant floor heating has a low operating temperature, a wide range of sources can be used to heat the water –a ground- source heat pump, a condensing or non-condensing boiler, solar or even district heating. McGrath Plumbing and Heating, of Waltham, MA, are experts in the application of radiant heating as well as a variety of plumbing applications. Please be sure to call Gary McGrath at (781) 893-1193 for email info@McGrathPlumbing.com for expert assistance. Buy from Amazon to support this site!